Shot Of Jaq is a ten minute, twice-weekly technology and Open Source podcast that is specifically designed to be the start of the conversation. We have taken care to build an environment optimized around conversation and discussion, and the Shot Of Jaq community is growing at a rate of knots. I just wanted to provide a few updates on the show. Has Skype Won The War? Shows come out every Tuesday and Friday, with Jaqback shows (special community shows where read out your emails) coming out about once a month on a Wednesday. Select Shot Of Jaq from the Select a Page drop down box and the second box will have code you can take to plonk on your website. Don’t forget to join the Shot Of Jaq Facebook Fan Page here! The whole point of Shot Of Jaq is to build a conversation and collaboration driven community around the show. As we re-iterate in every shot, we are the start of the conversation: ten minutes of short, sharp and fun discussion that we hope leads to continued conversation on www.shotofjaq.org. Since the show started, some community members have been looking to have a place in which they can work together on projects in and around Shot Of Jaq and we have not had such a resource available. We didn’t want to just throw up a wiki, disconnected and disjointed from the main Shot Of Jaq website…we wanted to re-think it. We now have a solution: the Shot Of Jaq Scratchpad. You can go to the scratchpad and without having to register or login, type in a name for your page into a box and a page will be created for you. There, you and other Shot Of Jaq fans can work together to share information, collaborate an otherwise be fun community people. There are plenty of options for adding markup, tables, images and lots more to make your page as rocking as possible. 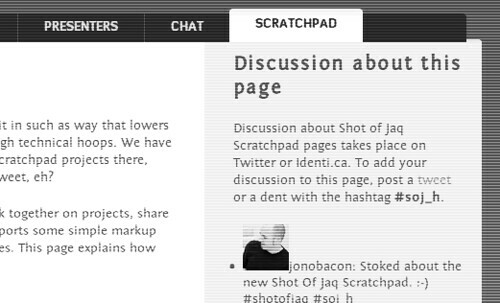 The Shot Of Jaq Scratchpad provides a simple way in which you can create content, work together and projects and discuss said content and projects on Twitter and identi.ca and have it all integrated together, right here on www.shotofjaq.org, and none of it require frustrating user accounts, sign-ups and more. Spreading The Word – we are really keen to help share each shot far and wide. We want people to join us in the conversation, but we need you folks to help spread the word. A page on how to publicise each shot would be awesome, with tips and tricks for our community members to use. Transcriptions – for our deaf Shot Of Jaq fans, it would be fantastic to have transcriptions, and fortunately because shots are so short, they are not too much work. Outreach Project – we have talked in the Shot Of Jaq Chat Channel about coming up with some stunts and ideas to spread awareness of the show – the scratchpad is a great place to scheme about this kind of thing! Resources – want to create Shot Of Jaq website buttons, banners and other material? Add them to the scratchpad! This is pretty sweet – are you going to take this and integrate it in any of the other bits of your web empire?